The Gaping Venus Clam is one of the commoner intertidal to shallow subtidal bivalves in southern Queensland. They live buried in sand within a few centimetres of the surface, with only the tips of their siphons projecting. Typically they fall prey to murex snails and sand snails, as evidenced by the holes these snails drill through the clam shell, but sometimes they are also eaten by sea birds. Mature specimens reach 50-60mm in length. 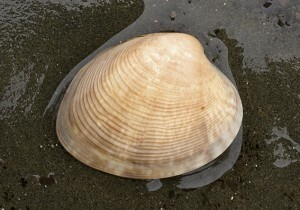 Isolated valves are frequently washed ashore, especially after rough weather, and often fresh-dead shells (with both valves still attached by the hinge ligament) are seen after heavy rain.